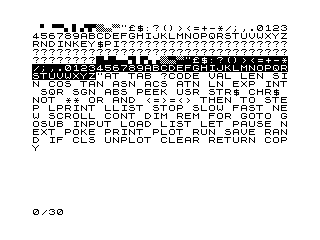 The Sinclair ZX81 character set rendered in the system font. Screenshot of a ZX81 8K BASIC program that demonstrates all code points including BASIC keywords and nonprintable characters, rendered as question marks. The character set has 64 unique glyphs present at code points 0–63. With the most significant bit set the character is generated in inverse video; corresponding to code points 128–191. These 128 values are the only displayable ones allowed in the video memory (known as the display file). The remaining code points (64–127 and 192–255) are used as control characters such as 118 for newline, or uniquely to Sinclair BASIC for keywords, while some are unused. The small effective range of only 64 unique glyphs precludes support for Latin lower case letters, and many symbols used widely in computing such as the exclamation point and the at sign. The lack of an apostrophe led some software authors to use a comma instead. There are 11 block graphics characters, counting code point 0 which also doubles as space. Together with the 11 inverse video versions these 22 code points provide every combination of the character cell divided into 2×2 black-and-white block pixels for low-resolution 64×48 pixel graphics, or into 1×2 black, white or dithered gray wide block pixels for a 32×48 resolution. The 2×2 versions of these are also present in the Block Elements Unicode block. Code point 11 is the double-quote (") symbol when used in the display file. The BASIC function CHR$ 192 prints as the same character but is shown as "" in BASIC source listings; it is used for including the literal " character in a string without conflict with the " string delimiter. The character set in the ZX81 was derived from the ZX80 character set. They have mostly the same code points, e.g. for A-Z and 0-9, but the code points are different for the block graphics characters, the symbols ", -, +, *, /, =, >, <, and the BASIC keyword tokens (with many new added). There are also changes to the control characters and code point 1 is no longer an unprintable string terminator. The ZX81 8K BASIC ROM was also available as an upgrade for the ZX80, replacing its integer-only 4K BASIC ROM. In the later Sinclair ZX Spectrum the entire character encoding was replaced with the ZX Spectrum character set, which is a derivative of ASCII and includes lower case letters and more. The ZX81 system font uses an 8×8 pixel-per-character grid where most glyphs fit in 6×6 pixels leaving two pixels horizontal and vertical space between rows and columns. This font was modified from the one in the ZX80's ROM which had slightly wider 7×6 pixel glyphs with only one pixel horizontal space between them. Some glyphs also received a different design in the ZX81 system font, noticeable on the *, the slashed and less rounded 0, and the less rounded $, C, G and J. The ZX Spectrum uses the same font as the ZX81 but adds many characters including the lowercase Latin alphabet. ^ a b Because they are 50% gray rasters, code points 8 and 136 have the same appearance although every pixel is inverted. Both can be expressed as Unicode character U+2592 ("Medium shade") in the Block Elements Unicode block, but of course if both are converted to the same code point the conversion is non-reversible. ^ a b c d Not in the Block Elements Unicode block. ^ a b Code point 11 is the double-quote (") symbol when used in the video memory (called the display file). Code point 192, CHR$ 192, prints as the same character but shows as "" in BASIC listings and is used for including the literal " character in a string without conflict with the " string delimiter. ^ a b c d e f g h i j k l m n o p q r s t u v w x y z aa ab ac ad ae af ag ah ai aj ak al am an ao ap aq ar as at au av aw ax ay az ba bb bc bd be bf bg bh bi Sinclair BASIC tokenizes keywords into single-byte code points. ^ The raise to a power multi-character operator tokenized into a single-byte code point. ^ The greater than or equal to multi-character operator tokenized into a single-byte code point. ^ The less than or equal to multi-character operator tokenized into a single-byte code point. ^ The not equal sign multi-character operator tokenized into a single-byte code point. ^ a b c Vickers, Steven (1981). Sinclair ZX81 BASIC Programming. Sinclair Research Ltd.
^ "8K BASIC ROM UPGRADE". ^ Wearmouth, Geoff. "An Assembly Listing of the Operating System of the ZX81 ROM". Archived from the original on August 15, 2015.